General Dynamics Ordnance and Tactical Systems – Canada (GD-OTS – Canada) supplies a broad range of 155mm ammunition capable of meeting the full range of contemporary mission requirements with maximum effectiveness. GD-OTS – Canada’s innovative ammunition technologies result in high-performance solutions that are revolutionizing the art of gunnery. The 155 mm High Explosive (HE) M107 HE cartridge is a separately-loaded howitzer munition used for blast and fragmentation effects. Its projectile is filled with approximately 7 kg of either TNT or Composition B and it is compatible with standard NATO fuzes. The M107 can be fired using the M3A1/M4A2, M119A2 or MACS charge systems. 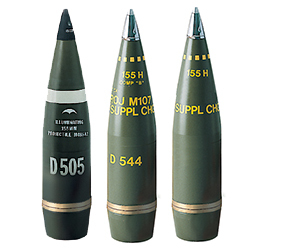 The 155mm MR103 artillery training ammunition provides a similar flash and smoke signature as the in-service 155mm M107 HE but with a greatly reduced fragmentation lethal area resulting in a significantly smaller safety template. The MR103 uses a spotting charge to deliver the necessary impact signature to properly train Forward Observers while reducing noise levels. Its ballistic match with the 155mm M107 provides realistic training for the complete gun crew. The 155 mm Illuminating (ILL) M485A2 cartridge is a separately-loaded munition. Its projectile has a hollow forged steel body containing an expulsion charge and an illuminating canister with a drag parachute. Following canister expulsion, the main parachute deploys with the flare candle suspended to its shrouds. The M485A2 cartridge can be fired using the M3A1/M4A2, M119A2 and MACS charges. Flare Burning Time and Performance: Up to 2 minutes producing approximately 1 Million candellas. Rate of Descent: 4 to 5 m/s. Canadian Armed Forces firing M777 Light Towed Howitzer.